MIRAGE HOBBY 1/35 FRENCH RENAULT UE "STUKA "
MIRAGE HOBBY 1/35 FRENCH RENAULT UE sWG 40/32 cm Wk FL. 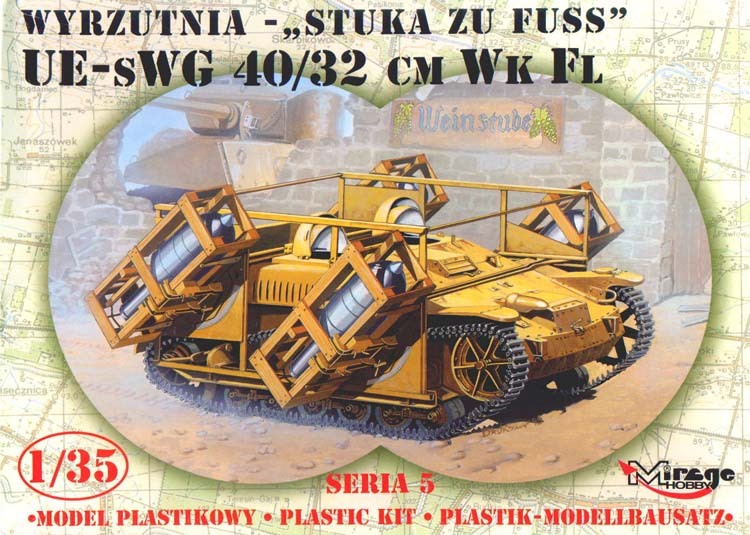 "STUKA zu Fuss"
The Renault UE tracteur was a French 2 ton tractor. It was designed to be a light towing and reconnaisance vehicle. It had a 4 cylinder alloy engine and a top speed of 33.6 km/h on good roads. A small, fully tracked trailer, was usually seen being pulled behind it. The French called it a light infantry carrier, but - in practice - it was too small to carry any troops other than the driver and co-driver. Both these guys would have had to been very small, in stature, as the vehicle is not much bigger than a Volkswagon Beetle. How do I know this? Well...in the next town to me a fellow has an actual UE that he is restoring - and I have viewed it several times. After the fall of France, the Germans captured many French vehicles...including a substantial number of UE's. They used them for artillery support tractors, field police duties, and I even saw a picture in one of my WWII history books of one pulling aircraft around a Luftwaffe airfield. In their role, for the Germans, as a infantry support vehicle, they were designated as Sicherungsfahrzeug UE(f) and were armed with one or two MG34 machine guns. As a rocket projector launcher/carrier they were designated as Infanterie Schlepper UE 630(f) mit 28/32cm wurfrahmen. (subject of this kit review). They were also used as a gun carrier and designated as the 37mm Pak 35/36 auf Infanterie Schlepper UE 630(f). Finally, as a munitions carrier they were known as Munitions Schlepper auf Infanterie Schlepper UE 630(f). The Germans first started using 28/32cm rockets, mounted in groups of three per side, on the Sd.Kfz. 251 half-track. 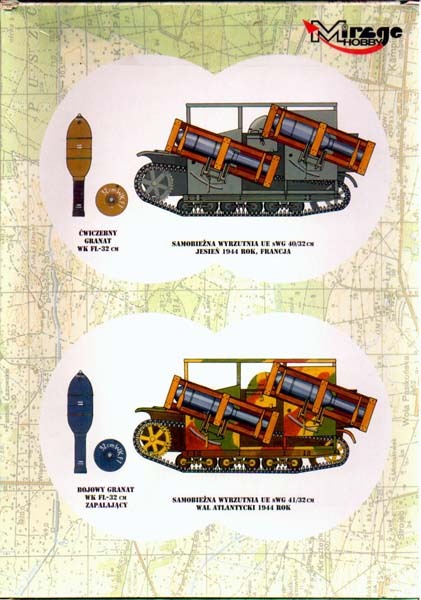 UE's and some other captured vehicles were later mounted with these weapons, however, in the case of the UE, only two per side could be mounted because of its small size. These rockets were loaded onto swivel racks and fired right out of their shipping crates. In some cases the rockets were loaded into permanent metal cages for firing, but not many of these were produced. The rockets could be elevated, but the whole vehicle had to be turned to aim them. The rockets were then fired in a set sequence. These vehicles had a couple of nicknames. 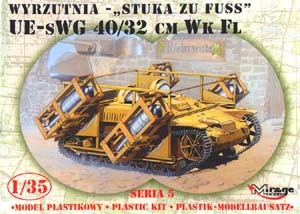 They were most often known as the "Stuka zu Fuss" or Foot Stuka. Another, less heard nick name was the "Heulende Kuh" or Howling Cow. They were often used to support panzer operations, especially in the early days of the invasion of the Soviet Union. Many of these improvised vehicles were used during the fighting in Normandy in 1944. The kit is packaged in an end opening type box. The background, printed on this box, is a line map of Poland. The box art shows a UE with its rockets parked in front of a winery with part of its wall demolished and what looks like a knocked out Sherman sitting behind it. The back of the box has two painting and decaling guides in full color. 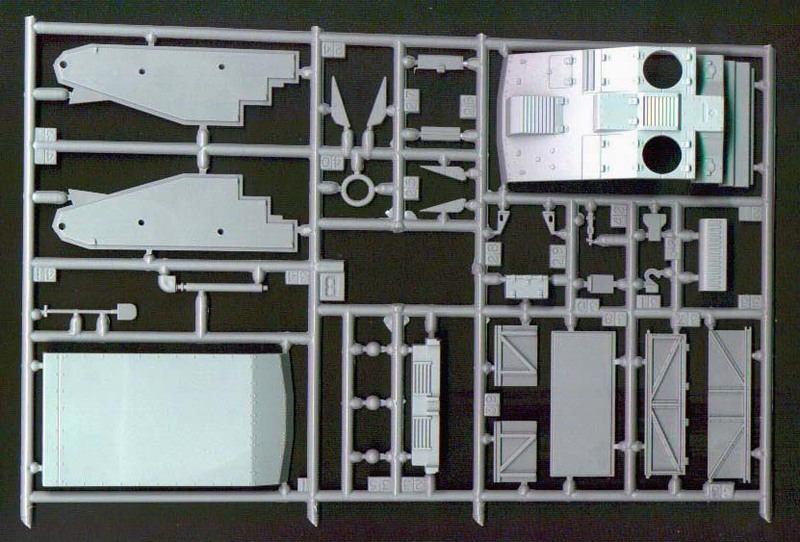 The kit contains eight trees of light gray parts, a small decal sheet, and the the instructions. The parts trees are in two cello bags of four trees per bag. There are two identical part trees letter "A". They contain link and length type tracks, boggies, road wheels, road wheel frames, return rollers, idler wheels, drive sprockets, tow hooks, fenders, and the unique domes that opened like a clam shell and protected the crew's heads. 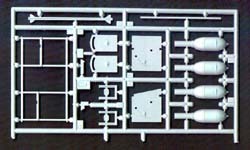 (56 parts per tree) Tree letter "B" holds the vehicles body parts consisting of the sides, top, bottom, rear and the pieces of the rear stowage box. There is also a storage box, tow hook, and louvered muffler shield, tools etc. (30 parts here) By the way, the rear stowage box worked like a dump truck and could be tilted and unloaded by rotating a chain driven wheel inside the vehicle. I know this by seeing the real thing. There are also two identical letter "D" trees. These trees contain more rocket halves, pieces of the rocket launcher frame and mounting plates. (14 parts per tree). The final parts tree is letter "E". 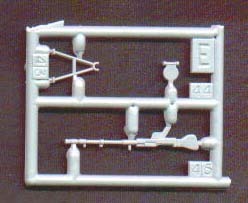 It is just a small tree that contains a MG34 machine gun with its tripod and ammo drum, but I cannot see anywhere on the instructions that they want you to use it to complete this kit. So, it is a spare. The instruction sheet is a small 9 3/4" x 6 7/8" format. It contains 6 pages. Page one begins with a black and white repeat of the box art followed by the vehicle's history in Polish only. Page 2 begins with an assembly symbol explanation, but - unfortunately for us English speakers - only in Polish. The rest of page 2, through to page 6, contain the balance of 15 assembly steps. Steps 1 through 8 devote themselves to the basic UE assembly and the rest show the rocket, shipping crates, and support frame assemblies. As mentioned earlier, we have to go to the box rear for the painting and marking drawings. Two schemes are shown there. If I am interpreting what I think the Polish captions are saying these are both for 1944. One scheme is overall panzer gray and is a vehicle used in France. 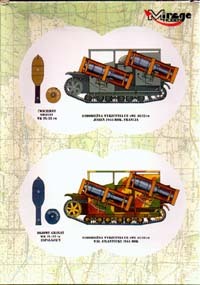 The second scheme shows a vehicle in a earth yellow with red-brown wave pattern cammouflage used at the Atlantic Wall. 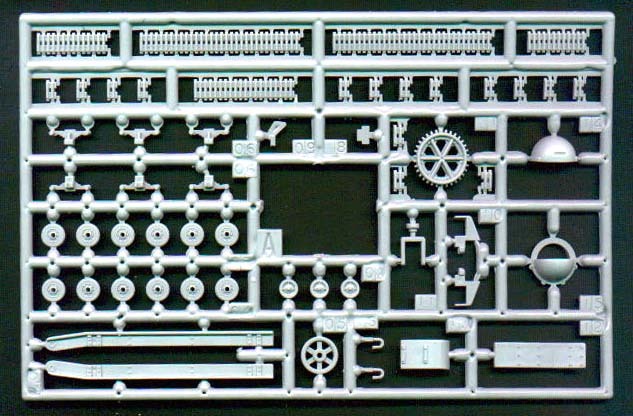 Decals give us stencils for the wood shipping crates and for the rockets, as well as a white outline German national cross and the numeral "1". No tactical or division markings are provided. There are no figures in the kit. Technical information on Renault UE's was hard to find. I was only able to find the bare bones on data on them. 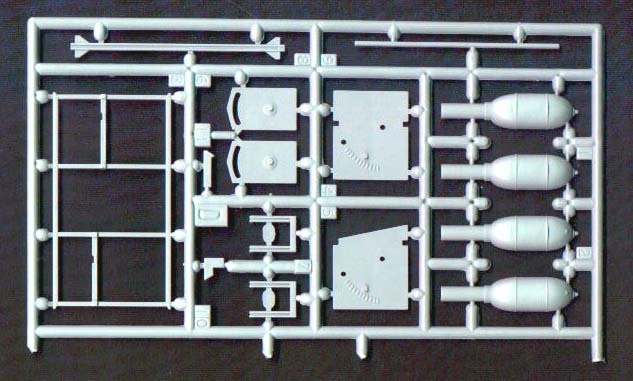 I got this kit in trade with my Japanese net friend Mitsu and want to thank him for the kit. 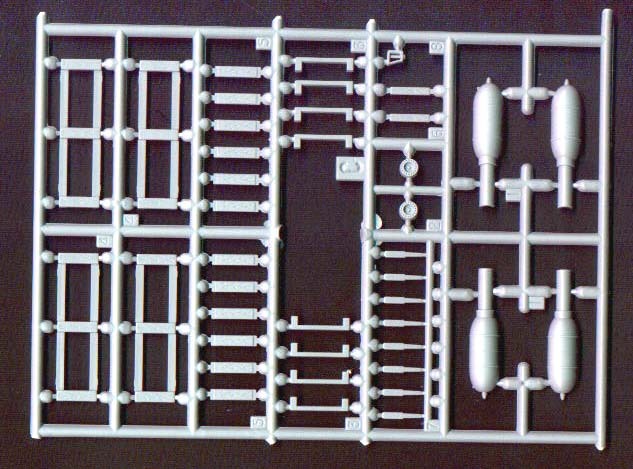 He also traded me a French Lorraine Schlepper kit which mounts the same rockets. The review of that kit appears elsewhere in this issue.